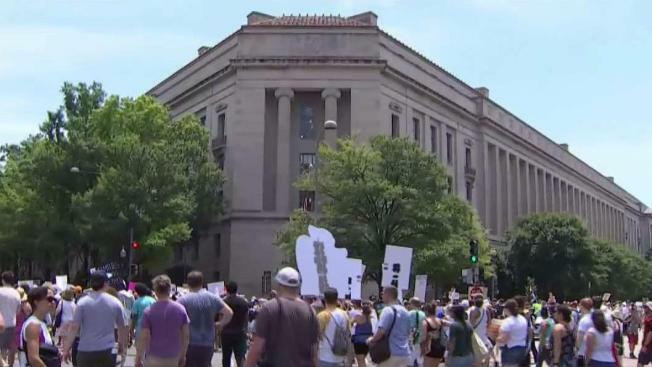 A man is accused of assaulting a Secret Service officer after the large immigration rally outside the White House on Saturday. News4's Scott MacFarlane reports. Steven Carmona is accused of illegally parking his BMW along Pennsylvania Avenue, moving a bicycle rack-style security barrier erected for the rally and screaming at the officers "Where is the president?" according to a Secret Service affidavit obtained by the News4 I-Team. "Carmona was placed under arrest for assaulting a federal law enforcement officer. While being placed under arrest, Carmona asked 'Where is the President?' He also stated to officers ‘Just end it, just kill me,'" the affidavit says. Organizers say 30,000 protesters gathered outside the White House for the Families Belong Together rally, where speakers made an emotional plea for children to be reunited with parents and an end to zero-tolerance immigration policies at the border. A News4 I-Team investigation reveals nearly 30 breaches of White House security since 2014.